"You stick a stake in my heart... that'll kill anybody." This episode explores the vampire figure in legend, myth and popular culture. The program spends time with the fetishistic Goth culture denizens of Club Fang, where vampire-wannabe Nicolas Strathman holds court, discusses his personal departures from vampire folklore, and demonstrates his consumption of blood from a willing "donor." Bram Stoker's Dracula is discussed in some detail, as is the historical figure Vlad Tepes Dracula, "Vlad the Impaler," who served as inspiration for Stoker's famous novel. Finally, the producers visit with Kathy and Dale McKinley, a rather spooky, obsessive Minnesota couple who claim to channel the spirit of Vlad on a regular basis, though he seems to have undergone a New Age makeover in the intervening centuries. Reputed poltergeist and ghost manifestations are examined, with attention paid to scientific as well as psychic explanations for some of the phenomena. The legends surrounding John Stone's Inn, a New England establishment built in 1832, seem designed to draw tourists more than anything, though the purported ghosts have some basis in historical fact. Two young girls who claim to sense an otherworldly presence in their family's new home seem giggly but convinced of their own experiences, and the spiritual happenings witnessed by various locals at Bobby Mackey's country music establishment are colorful if not particularly convincing. Structural engineers and ghost hunters alike opine about ghosts and poltergeists, making this an entertaining episode. This program is more focused on human interest than any sort of supernatural occurrences. Tim McCarthy discusses his experience as a Secret Service agent called upon to use his own body as a human shield for President Reagan during the Hinckley incident. Bicyclist Karen Schlachter recalls her selfless, empathy-driven rescue of a dazed diver about to go over Niagara's Horseshoe Falls. Korean War veteran Bob Simanec remembers how he used his own body to absorb grenade blasts which otherwise might have decimated his trenchmates. All of these stories are impressive if not really "unexplained," and some psychologists are called upon to discuss the training, instincts, personal characteristics and even genetics that may lead to such acts of heroism. This episode investigates the well-documented but still puzzling incidents in which humans have apparently burned themselves up where they sit, without disturbing their surroundings to any great degree. Despite some enthusiastic remarks by Larry Arnold of ParaScience International (author of the book Ablaze! ), the most convincing analyses come from various fire experts and legitimate scientists, who provide a credible hypothesis that's nearly as fascinating as the standard paranormal explanation. Historical context is provided by an examination of Charles Dickens' reference to spontaneous human combustion in his novel Bleak House, and some grisly but remarkable photos of burned, disintegrated victims make this the most morbidly attractive episode in this set. Image Transfer Review: A&E's DVD presents the program in its original 1.33:1 made-for-television full-frame format. The digital transfer is very solid, given the material's broadcast-videotape source—details are clear, color is natural, and the only distracting video defects stem from the digital editing tools used to achieve some of the program's visual effects, resulting in visible resolution loss and pixelation. The DVD transfer is very solid and much better than most TV-sourced documentary material I've seen. Audio Transfer Review: The Unexplained features its original stereo soundtrack in Dolby Digital 2.0 format. Despite the potential of the subject matter, there's not a lot of dramatic audio content here; still, music and interview segments are clean and clear, aside from some unintentional low-frequency noise in one scene. Nothing fancy, but the audio supports the program well. Extras Review: A&E's two-disc set features 24 text-menu chapter stops (6 per episode), with no supplements of any kind. Given the programs' thorough and even-handed approach, no extras suggest themselves, and a handy "Play Both Episodes" menu item on each disc makes for convenient viewing. 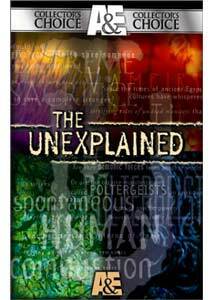 A&E's The Unexplained explores unusual phenomena with a fairly objective eye, making for fascinating viewing that rarely seems dry. A&E's two-DVD set features solid transfers and enough content to make it a worthwhile investment for fans of the mysterious and offbeat.